ANN ARBOR, MI – Citizens opposed to construction of the ET Rover natural gas pipeline, particularly the route it would take through lakeside areas in western Washtenaw County up to Livingston, are still trying to stop the project, and local officials are with them. 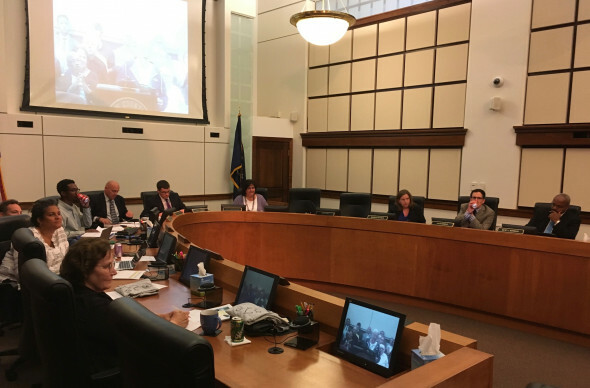 As the Washtenaw County Board of Commissioners approved a resolution Wednesday night, June 28, reiterating its opposition to the project, at least one county commissioner said she’s willing to stand in front of bulldozers if it comes to that. “There was a huge government failure here,” said Commissioner Michelle Deatrick, D-Superior Township, who brought forward the resolution the board approved 7-0. “There was a regulatory failure at the federal level,” she said, speaking to the many pipeline opponents in the audience. Deatrick received a round of applause from the many citizen activists who attended the meeting, and so did her colleagues who joined in sharing concerns about the $4.2 billion pipeline project. Several residents from the Dexter and Pinckney areas, as well as the president of the Ann Arbor YMCA, spoke out at the meeting. Residents and county officials fear pipeline construction is imminent in Dexter Township near the Ann Arbor YMCA’s summer camp along Silver Lake, one of the areas they want to protect from environmental damage and threats to public health and safety. Residents and county officials, as well as the YMCA, are concerned about the possibility of a pipeline explosion and the impact radius, and they argue the only possible evacuation routes could be cut off by the pipeline in the event of such a disaster. Construction is already underway along other parts of the route, which spans about 713 miles from West Virginia and Pennsylvania through Ohio, with an interconnection in Defiance, Ohio, then crossing into Michigan, where it is to terminate in Livingston County after passing through western Washtenaw County, west of Ann Arbor. Energy Transfer Partners and Traverse Midstream Partners are behind the project and have a website dedicated to providing information about it at RoverPipelineFacts.com. The project received a certificate of public convenience and necessity from the Federal Energy Regulatory Commission in February. The pipeline is expected to be brought into service in sections. The first section in Ohio is expected to come online in July, and the full line is expected to be in service by November. Alexis Daniel, a spokesperson for Energy Transfer, said the Rover pipeline route under construction was approved by FERC after it was surveyed and carefully vetted and planned for more than two years. County commissioners thanked residents for sharing their concerns Wednesday night, saying they agree the pipeline route puts people’s lives in extreme danger. “And that seems unconscionable to me,” said Commissioner Felicia Brabec, D-Pittsfield Township. Members of a group called Michigan Residents Against ET Rover Pipeline are directing people to OverWithRover.com. They carried maps with them to Wednesday night’s meeting to show how the only possible escape routes could be blocked if there’s an explosion of the pipeline next to Silver Lake. Deatrick said because there’s a safer alternative, the current pipeline route unnecessarily places residences and large parts of the Ann Arbor YMCA’s summer camp next to Silver Lake in danger. She and others argue death, injury and serious property damage likely would occur if there’s a pipeline rupture or explosion there. “Finally, the pipeline developer, Energy Transfer, plans to save money by not odorizing the gas, meaning that if a rupture occurs, no one would be able to smell it,” Deatrick said. She said this is a case of a federal regulatory agency, FERC, ignoring input from the public about a significant public safety hazard in the interest of pleasing fossil-fuel companies. Tamara Young-Allen, a spokeswoman for FERC, said the commission’s rationale for conditionally approving the Rover pipeline project is detailed in its Feb. 2 order. The commission found the benefits the pipeline would provide to the market outweigh any adverse effects on landowners and surrounding communities, and that the environmental impacts could be reduced to acceptable levels if certain conditions are met. Young-Allen said all of the concerns that have been raised in requests for rehearing or appeals of FERC’s order are currently under review and pending a commission decision. “It is FERC policy that we not comment on or speculate about potential commission decisions,” she said, noting the commission currently lacks a quorum of three commissioners to make final decisions. President Donald Trump’s FERC nominees, Robert Powelson and Neil Chatterjee, await confirmation by the U.S. Senate. Many environmental groups, including the Sierra Club, are urging the Senate to vote against Trump’s nominees, saying they would increase FERC’s bias toward the fossil-fuel industry and further marginalize communities that oppose pipelines and other fossil-fuel infrastructure that damage people’s homes, livelihoods and communities. Smith said the U.S. Army Corps of Engineers still has an opportunity to revoke the permit for the project. He won support for an amendment to the board’s resolution, adding a section urging the Corps to revoke the permit and instead require individual permits for each water body crossing for the length of the pipeline because of the environmental impacts. “I understand that the board of commissioners opposed this pipeline in 2014,” said Commissioner Jason Morgan, D-Ann Arbor, arguing there’s more information and more reason to oppose it now. Commissioner Ricky Jefferson, D-Ypsilanti, said he’s taking to heart the concerns he heard from residents. “It’s a rallying cry here tonight,” he said, indicating he wants to do whatever he can and he thinks Deatrick said it best. County Board Chairman Andy LaBarre, D-Ann Arbor, said he didn’t want to give residents any false hope that the board’s resolution would actually stop the pipeline, though. The pipeline through Washtenaw County would be 42 inches in diameter. One resident used a visual aid Wednesday night to show just how big that is, holding up a hoop of sorts. The board’s resolution indicates 72 miles of the pipeline would be in Michigan, including 28 miles in Washtenaw County, 29 miles in Lenawee County, and 15 miles in Livingston County. In Washtenaw, the route passes through the townships of Manchester, Bridgewater, Freedom, Lima and Dexter before entering Livingston County and Putnam Township, ultimately running to an interconnection with the Vector pipeline in Howell. The pipeline is designed to transport 3.25 billion cubic feet of fracked natural gas per day under high pressure. Up to 68 percent of the gas is for distribution in markets across the U.S., while the remaining 32 percent is to be delivered to markets in Michigan via an interconnect with the existing Vector pipeline, which also is expected to transport some of the gas to Ontario. “The proposed path for the new pipeline in Washtenaw County passes through residential areas and wildlife habitats, as well as ecologically sensitive areas including wetlands, creeks, streams and floodplains, meaning the pipeline’s construction would destroy natural beauty and negatively impact these areas’ ecosystems and, in the event of an accident, endanger farmland and groundwater,” the board’s resolution states, estimating the total annual greenhouse gas emissions caused by the pipeline would be about 145 million metric tons, with an emissions equivalent of 42 coal plants or more than 30 million cars. Resolutions opposing construction of the Rover pipeline also have been approved by officials in Freedom Township, Lima Township, Dexter Township and the Village of Pinckney. “The extensive damage that can be caused by construction of a natural gas pipeline is illustrated by the 18 pipeline-related spills and other environmental violations that have occurred during Energy Transfer’s construction of the Rover pipeline in Ohio — including the April 13, 2017 release of more than 5 million gallons of drilling fluid contaminated by diesel fuel into a wetland — resulting in nearly $1,000,000 in fines by the Ohio EPA against Energy Transfer, and is further illustrated by the damage from a simple leak from a high-pressure pipeline in May 2015, which resulted in a large crater in Lyndon Township, Washtenaw County, even though no spark or flame made contact with the escaping gas, and the damage was only from a leak,” states the resolution approved Wednesday night. The resolution notes the Rover pipeline project involves horizontal directional drilling, raising concerns that an inadvertent return of bentonite drilling fluid or other spill could potentially and substantively threaten the Huron River watershed and the drinking water supplies of downstream communities, including Ann Arbor, which draws its water from Barton Pond, an impoundment on the Huron River. The resolution also raises concerns that the Rover pipeline project could cut off the Silver Lake community in Dexter Township from any means of evacuation in a pipeline emergency, including 90-plus residences, the YMCA’s Camp Birkett, which has 100-plus children and 20-plus counselors per day seasonally, the Post 46 Hunt and Fish Club, and Pinckney State Recreation Area campground and beach. County officials claim that potentially entraps 2,000 or more people, preventing them from escaping a catastrophe or receiving incoming emergency help. The resolution also raises concerns about what residents and the county argue was a lack of opportunity for public review, comment or assessment of an alternate route in Dexter Township. The resolution further calls for “odorization” of the natural gas before it reaches the Silver Lake area in Dexter Township to allow warning of potential leaks and “impending disaster” to passersby. Commissioners argue that’s a critical federal requirement for mitigating the known danger of gas lines, especially with children playing nearby. “The Rover pipeline project route near Silver Lake passes sufficiently close to the YMCA Camp Birkett in Dexter Township that the potential impact radius would extend 834.9 feet into the YMCA camp,” the board’s resolution states, describing the camp as a high-consequence area where a pipeline accident could have significant consequences, a circumstance the county argues is not necessary in light of the existence of a “superior alternative route” in Dexter Township along an ITC easement, a route the county argues does not involve entrapping the communities and people previously described. 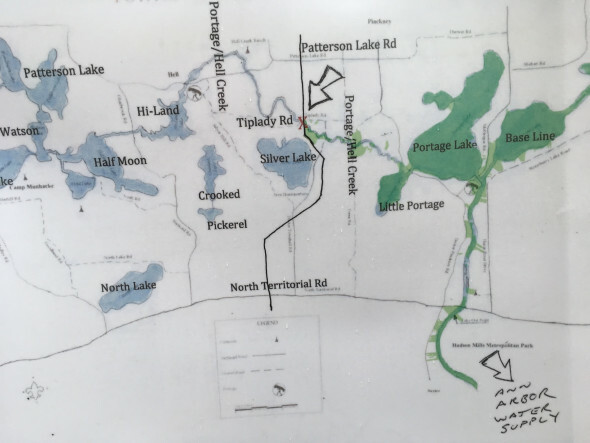 “The Washtenaw County Board of Commissioners strongly opposes the current route marked out and surveyed for the pipeline near Silver Lake in Dexter Township and urges use of the alternate route along the ITC easement in order to substantially reduce the risk of entrapment of 2,000 people or more in the event of a pipeline accident,” the resolution states. The county is sending copies of the resolution to President Donald Trump, Michigan’s members of Congress, Gov. Rick Snyder, Washtenaw County’s state legislative delegation, FERC, the U.S. Department of Transportation’s Pipeline and Hazardous Materials Safety Administration, the Michigan Department of Environmental Quality, the Michigan Emergency Operations Center, and the Washtenaw County Emergency Services Division. Commissioners Alicia Ping, R-Saline, and Kent Martinez-Kratz, D-Chelsea, were absent Wednesday night. Godspeed to these people on their courageous journey!